So, you have decided to upgrade your home and purchase new counter tops...perhaps the most important decision you will make during this process will be choosing a fabricator. Whether you choose a natural stone such as granite or a man-made material such as quartz, the quality of the fabrication and installation could be the difference between a beautiful kitchen or nightmare experience. Today we will discuss seams. What are seams? Seams are where two pieces of counter top material are joined together. Most slabs are no longer than 10 feet, therefore, in some kitchens a seam will be inevitable. At US Marble & Granite, we do our best to minimize the number of seams as well as make the seam as inconspicuous as possible. Quality seams require precision craftsmanship and skill. Good seams should be flat, smooth, less than 1/16 of an inch wide, and maintain pattern flow/direction. At US Marble & Granite, our seams are some of the best in the industry...you can view our photo gallery here to see what quality seams look like (if you can find them). 1.) The basics of a quality seam: As mentioned above, the seam should be flat, smooth, inconspicuous, and not noticeable. Below is a photo of a terrible seam. The granite in this photo is a very consistent pattern, therefore, the seam should be almost invisible....as you can see...it is not. 2.) 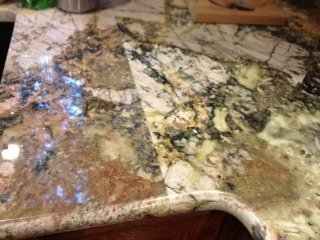 Getting a quality seam in a stone that has unique veining: Many of our customers are drawn to unique looking slabs. The uniqueness and veining in natural stones such as granite is what makes them so beautiful, so it is our job to minimize any disruptions. Below is a photo (not our work) of bad seam in a very unique slab with a lot a veining. You can see that a sloppy seam in this material can look very unsightly. 3.) Seams that maintain pattern flow: As mentioned above, some stones have a directional flow with the pattern or veins. Once again, the failure of your fabricator to not maintain that directional pattern flow throughout your kitchen (or other area) will have a bad result. Below is a photo of bad seam in a stone with a pronounced pattern or flow. Older PostWhat is the difference between Quartz and Granite Countertops?